Heat oven to 375°F. Line cookie sheet with Reynolds Parchment Paper; set aside. Beat sugar and butter with electric mixer on low speed or with spoon until light and fluffy. Stir in vanilla, nutmeg and egg. Stir in flour and baking soda. Shape dough by teaspoonfuls into balls. Place about 2 inches apart on lined cookie sheet. Flatten with bottom of glass dipped in sugar. Bake 9 to 11 minutes or until set. Remove from cookie sheet to wire rack. 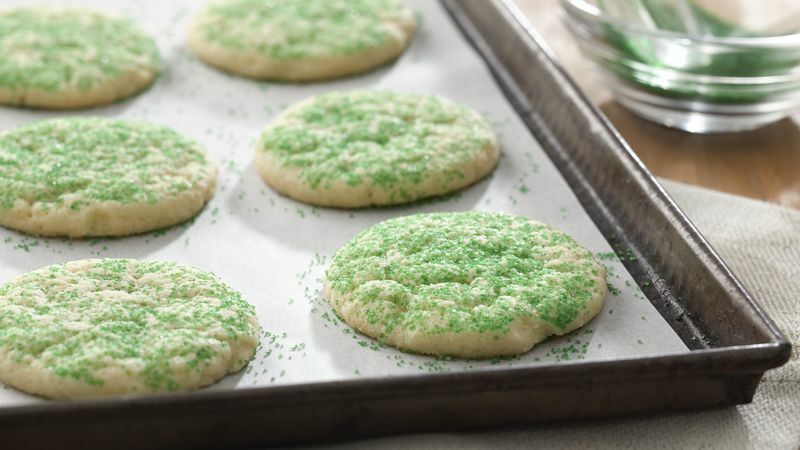 If you bake cookies often, have at least 3 or 4 cookie sheets, so as you bake 1 sheet, you can get another one ready to go. Butter gives a more buttery flavor and a crisper cookie than margarine. If you love the buttery, sweet taste of homemade sugar cookies, but don’t have the time to fuss with cutouts, this is your recipe. In just over an hour, using ingredients you probably already have on hand— Gold Medal All Purpose Flour, butter and vanilla to name a few—you can have a warm cookie in hand. One thing we love about this recipe is that it’s so much fun to make with others, especially children. After all, what could be better than smashing a ball of cookie dough with the bottom of a sugar-coated glass? To add some extra-special seasonal sparkle, make your own colored sugar. Place 1/2 cup granulated sugar in a resealable plastic food-storage bag, add liquid food color to tint as desired and seal the bag. Then, squeeze and rub sugar in the bag until it becomes evenly colored. If it clumps, just break it apart until the clumps are gone—another task children will love! The short cooking time, basic ingredients and most of all—the perfect flavor of these cookies—make them too good to save for the holidays. We consider them a staple in the Betty Crocker Kitchens all year round. There’s more than one way to bake sugar cookies—try another recipe, like these Sugar Cookie Truffle Cups or read up on Betty’s tips for baking classic sugar cookies . We’re sure your efforts will be rewarded when you serve up a plate of these to family and friends!